A plumbing leak is a major headache — Leaks waste water, drive up monthly bills and can even cause serious damage in your home. But there’s another consequence you’ve probably never thought about: pests. Uninvited houseguests, including rodents and insects, need water to survive, and even a small amount of water is enough. When you have a plumbing leak – even if it’s just a drip – it provides a steady stream of water. Since leaks are often hidden behind walls, they can create the perfect environment where pests can make their home without your knowledge. Seeing pests doesn’t necessarily mean you have a water leak, but it certainly warrants some investigation. Pay attention to where you see pests most frequently, and inspect nearby areas that have access to running water. 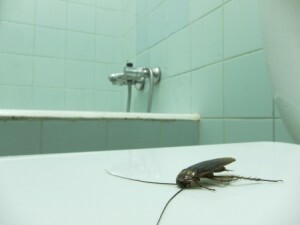 If you’re seeing cockroaches, check under your refrigerator for pooling water. If your freezer has an icemaker, check the water line as well. Inspect water lines leading to dishwashers and washing machines as well. You should also check for moisture under bathroom and kitchen sinks. Open your cabinets, and look for signs of moisture underneath sink traps and garbage disposal units. If you discover a leak of any size, repair it right away. If you aren’t able to do so yourself, contact a reputable plumber for assistance. When trying to get rid of pests, it’s crucial to make sure that there aren’t any active water sources. Even a pinhole leak can sustain countless pests and make traps and pesticides virtually useless against the invaders. If you can’t find a leak, a water source or a food supply that’s attracting pests to your home, they may be entering your home through another plumbing-related vulnerability. The seals surrounding plumbing pipes entering your home could be allowing pests to enter your home if they aren’t secure. At Larry & Sons, we can help you deal with plumbing problems in your home and prevent pests from taking up residence. From leak detection to major and minor leak repair, we do it all! If you need a Hagerstown plumber, give us a call now at 301-733-5428.